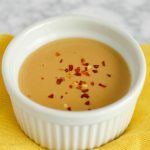 This easy peanut sauce recipe is made with only 5 simple ingredients you probably have on hand! The perfect healthy and gluten free condiment for peanut butter lovers! Add all ingredients to jar with tight fitting lid. Replace lid, and shake vigorously for 30 seconds. *soy sauce can be used if not strictly gluten-free.